We’re always on the lookout for healthy and nutritious foods, especially vegetables. A couple of Portuguese friends introduced me to hearty leafy-green Collard Greens. My first taste of Collard Greens were in a hearty Portuguese soup called Sopa de Couve, or Collard Greens Soup. 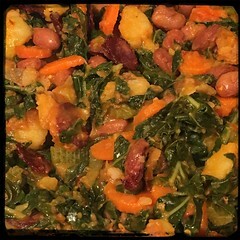 Sopa de Couve is a common Portuguese soup made with Portuguese Chorizo, tomatoes, beans and Collard Greens.The following recipe for Collards, beans and potatoes is not a soup but a tasty side dish that goes well with grilled beef or pork. 1. Parboil potatoes for 2 minutes after water boils. Drain and set aside. 2. In a large sauce pan, heat 2 tablespoons of olive oil and Fry the thinly sliced Chorizo sausages until they’re well done and crispy. Remove and set the cooked Chorizo aside. 3. Add 2 tablespoons of olive oil to sauce pan and cook shallots (or onions and garlic) and hot pepper flakes until the shallots begin to show some translucency. 4. Add 1 tbsp butter then the potatoes, let cook until slightly browned (lightly salt and pepper). 5. Add carrots and celery, cook until celery begins to show translucency and carrots begin to soften. 6. Add 1 cup chicken stock and let come to boil. 7. add the 1/2 cup of pimenta and let come to a boil. 8. Add chopped collard greens and cover sauce pan. Mix frequently. 9. Once Collard greens begin to soften fold in the romano beans and let simmer for another 10-15 minutesseasoning with salt and pepper to taste. 10. Finally toss in the cooked chorizo.